We have planned an exciting event so we can mingle and discover one of the many jewels you can find in the region. 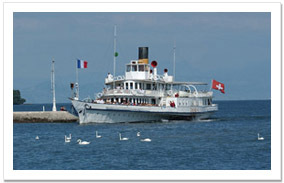 Paddle steamer cruise from Lausanne to Chateau de Chillon with aperitif onboard. Exclusive visit (Castle rented for FOSS4G2006). Dinner in the Castle and back by bus to Lausanne or dinner on return trip by boat, followed by entertainment in downtown Lausanne. Just after the Social Event at the Chillon Castle, for those of you who want to prolong the party, let’s meet at the Cult Club in Lausanne. The buses will bring you from Chillon to Lausanne City, the buses will first stop at the Cult club and go on to the hotels for those who are too tired. Each bus will drive to specific hotels. Watch carefully the indication on the buses. Or don't hesitate to ask us, we know the region very well, so we can give you some ideas... For instance, our local tourist office can organize some activities for Saturday (see description). Please complete the registration form if you are interested. Whether you’re nostalgic for old computers or a fan of the latest technology, the Musée Bolo has something to interest you. Through exhibits centered on different themes, you’ll discover the great classics of an object that’s now commonplace - the computer. Next to the conference, on EPFL campus. 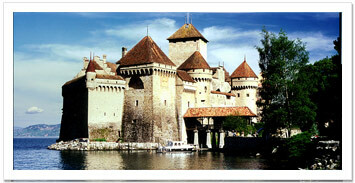 Even if you have little time for sightseeing, don’t forget to visit the Cité, the old medieval town of Lausanne.